NASA's twin Voyager probes were launched in the late 1970s to explore the outer planets in our solar system. But now, nearly 34 years later, the two spacecraft are on their way out of our cosmic neighborhood, knocking on the door of interstellar space. Voyager 2 launched on Aug. 20, 1977, and Voyager 1 launched about two weeks later, on Sept. 5. Since then, the spacecraft have been traveling along different flight paths and at different speeds. Both spacecraft are still sending scientific information about their surroundings through NASA's Deep Space Network. 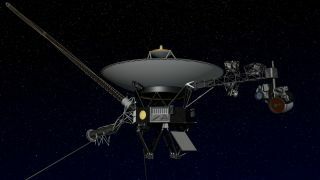 A signal from the ground, traveling at the speed of light, takes about 13 hours one way to reach Voyager 2, and 16 hours to reach Voyager 1. Between them, the two spacecraft have explored all the giant outer planets of our solar system -- Jupiter, Saturn, Uranus and Neptune -- as well as 49 moons, and the systems of rings and magnetic fields those planets possess. The current mission, the Voyager Interstellar Mission, was planned to explore the outermost edge of our solar system and eventually leave our sun's sphere of influence to enter interstellar space -- the space between the stars. Both Voyager spacecraft carry recorded messages from Earth on golden phonograph records -- 12-inch, gold-plated copper disks. A committee chaired by the late astronomer Carl Sagan selected the contents of the records for NASA. The records are cultural time capsules that the Voyagers bear with them to other star systems. They contain images and natural sounds, spoken greetings in 55 languages and musical selections from different cultures and eras. Voyager 1 has reached a distant point at the edge of our solar system, where the outward motion of solar wind ceases. The event is the latest milestone in Voyager 1's passage through the heliosheath, the outer shell of the sun's sphere of influence, before entering interstellar space. Interstellar space begins at the heliopause, and scientists estimate Voyager 1 will cross this frontier within the next five years.